Making pasta is such an ego boosting experience. LOL For many it seems out of reach. We doubt ourselves. We buy every pasta book that we can find and then they sit on our shelves…untouched. I will admit, it can be a daunting task to a new cook. It can be expensive to start (if you want all of the bells and whistles) but the rewards, if you try and succeed, are unexplainable. 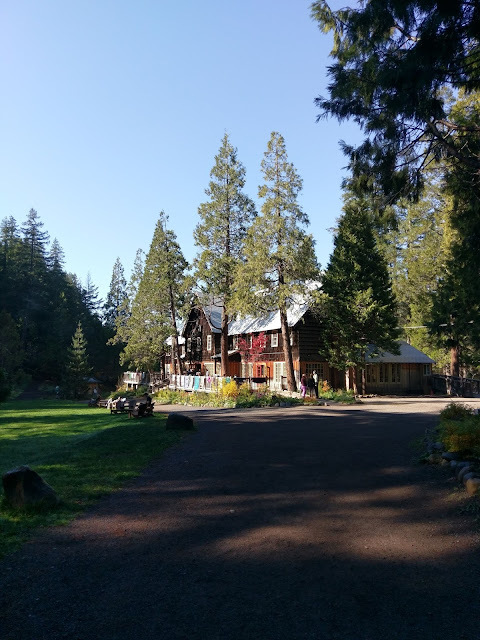 You can't wait to do it again….and again….over and over. It's the first time that the dough comes together, the first bite of pasta from a loved one, the feeling you get in your stomach once you realize that "you did it" and "that it wasn't that hard". I am starting to sound sappy…but it's true. 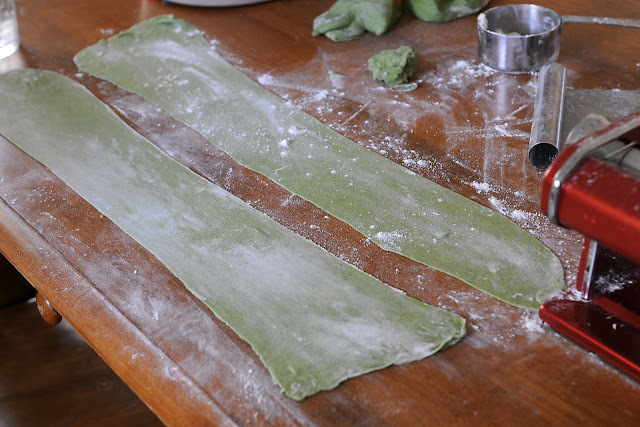 Talk to most home chefs and they have probably had some of these experiences with making pasta. Over the years I have made a ton of pasta. Usually I use the pasta for ravioli's, spaghetti or tagliatelle. 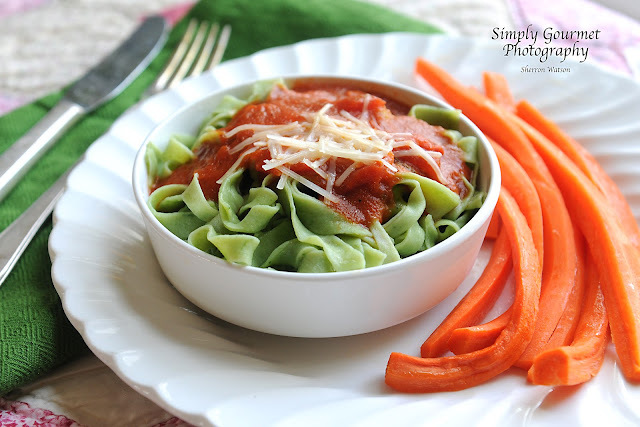 I have always wanted to make pasta that was tinted with some type of pureed vegetable. 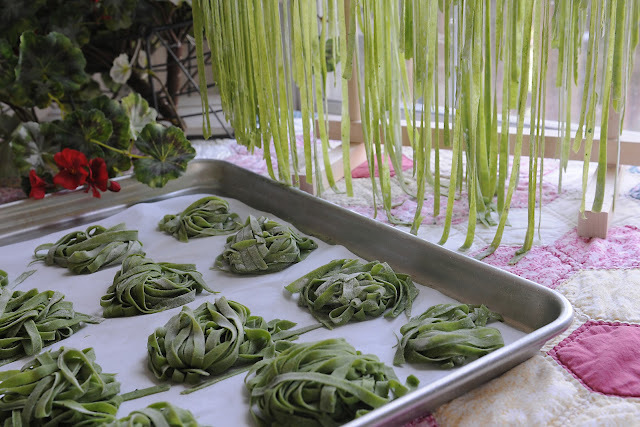 When I saw this recipe for green spinach pasta I just knew I wanted to make it. I saved the recipe on my Pasta board with Pinterest. Yesterday must have been the day because I woke up and discovered that it was National Spinach Day and the excitement over came me. I quickly found the recipe and went to work. Isabella loves to make her own pasta and to play with the machine. She was so proud of her "spaghetti" that she ate everything she made…two huge bowls. I love that little kidlet! This recipe is easy. The instructions are pretty straight forward. 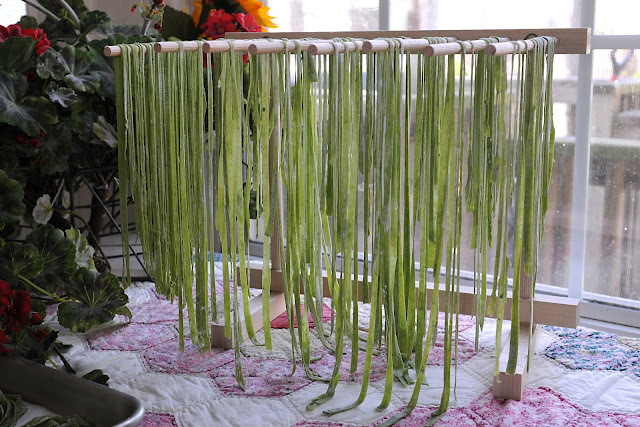 BUT…what if you are reading this and you have never made pasta before. This is where I struggle with writing my recipes. WHY? It is so easy for me to copy and paste, give credit to Paula and be done. SIMPLE. Because, like me when I first started, what if you have never made this before…there are tricks to know, there are reason's that I do certain things, I don't want you to fail. I am a curious person, I need reasons and explanations. I assume that my readers want the same thing. If you don't, then skip to the bottom and run with it baby…run like the wind. 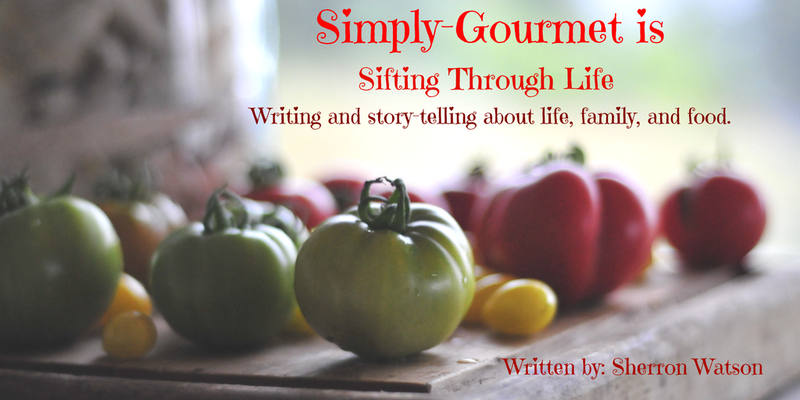 Although, IF, you need more "explaining Lucy" (you should use Ricky's voice from I Love Lucy when you read that part) then I hope that I can offer you your answers and a bit of encouragement to try and then succeed with which ever dish you decide to try from my blog. Pasta making is like bread making. There is a learning curve but once you get through your first few batches and you can read the dough and make your adjustments based on the recipe, the humidity, the type of pasta that you are making, it does all come together. Place flour into the bowl of your stand mixer. Create a well. Add eggs, salt. Using paddle attachment, mix together until well combined. Add spinach. Continue mixing until a ball forms. Scrape sides as necessary. Adjust recipe here. Add more flour if dough is wet. This is the step that you really have to pay attention to, your dough. You want your dough to form the ball that she is talking about. If your dough is still sticking to the bottom of your bowl, then you need to add a little bit more flour. Just a teaspoon at a time will do the trick. The dough will continue to be mixed in the bowl and you will notice that it is not sticking to the bottom of the bowl anymore. The dough will feel very stiff if you touch it at this stage of the game. Switch to dough hook and knead dough for approximately 5-6 minutes. Cover mixing bowl with kitchen towel and allow dough to rest for at least 30 minutes. This is the step that takes your dough from a stiff ball of flour and egg to a supple version that is soft and pliable. You really need to mix the dough the whole amount of time that she recommends, don't skimp on this part. The flour needs to be worked and this will get the job done for you. Otherwise this part will need to be done by hand and it can take twice as long. Your dough has to rest! Again, this step is important. You will notice that as your dough sits longer and longer it gets softer and softer. If you won't use the dough right away, you can wrap the 4 equal portions in plastic wrap and set them aside. Attach roller attachment to mixer. I used my pasta machine that is not an attachment to my mixer. Cut dough ball into 4 equal portions. Take 1 portion and flatten it with your hand. Run through roller attachment until it reaches a level 4 thinness. I give step by step instructions here on how to run your pasta through a pasta machine. You should run it through on 0 several times while refolding the dough into thirds each time. Then start going through the numbers on your pasta machine. I stopped at 6. This dough was tricky to work with the machine. It was very damp compared to my other recipe. This matters because it means that you have to use a lot more flour when running the dough through the machine. 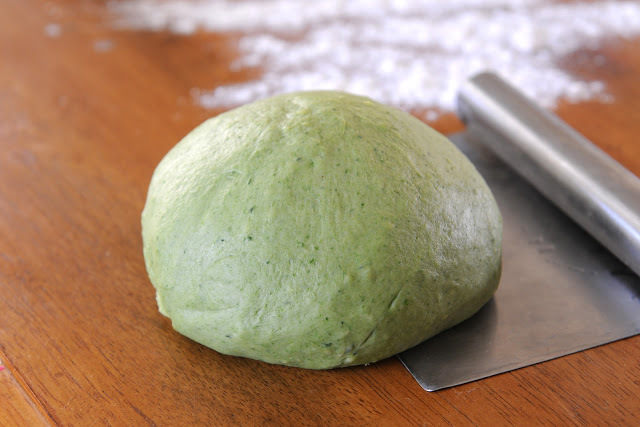 Don't be afraid to dust your dough sheet each time you run it through the machine. You don't want your dough getting stuck in the machine. It also helps to let the sheets sit for a minute and get a bit dry to the touch before running them through your pasta attachment. I also like to use my pastry scrapper to square up the end before running it through the attachment. Attach Fettuccine attachment to mixer. Feed dough through. Lay fettuccine on a lightly floured work surface. Continue same process with 3 remaining dough portions. This recipe made enough for my family of 5. 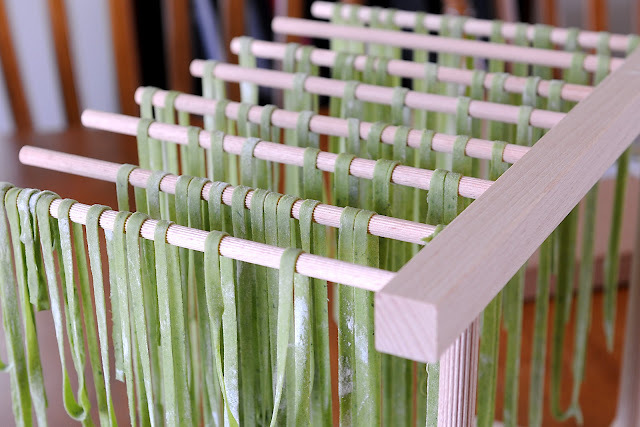 I have a drying rack that I like to hang my pasta on. I live in a very humid area and laying the pasta on a cooking sheet for any length of time, causes the pasta to get very soft and stick together. I find that by letting it hang and dry the noodles cook up wonderfully. I also had a reader use coat hangers to hang her pasta. I love that idea! In a large stock pot boil your water and add salt. I big tablespoon of salt. These noodles cook quickly, maybe 3-4 minutes per batch. In a sauce pan combine the above ingredients. Cook over medium heat and let simmer for 30 minutes or longer. 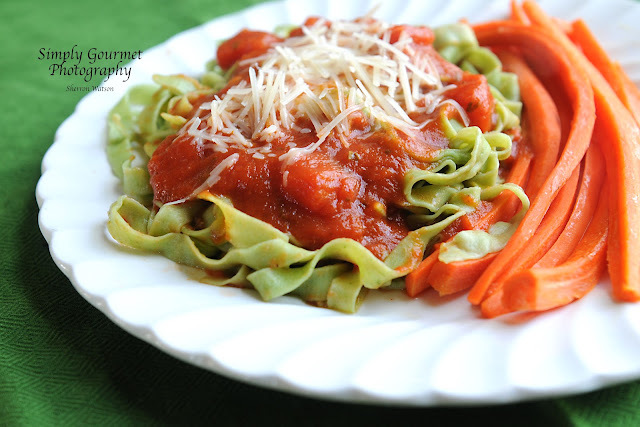 Taste your sauce and make sure that it has a good balance of flavors for your family. We like ours a little bit sweet, so I add a touch of sugar. I would recommend starting the sauce first so that it has time for the herbs and tomatoes to blend together. Serve this sauce with your fresh pasta and top with Parmesan Cheese. Have been having fun with my Kitchen Aid attachment I got for Christmas, but have yet to try spinach pasta. Yours looks beautiful! I have been wanting to get a pasta attachment for my Kitchen Aids for a LONG time. I think you've finally lit the fire under my bum to get one ASAP. :) Gorgeous, simply gorgeous. Thank you Megan. Let me know if you have any questions when you get to making your pasta. Enjoy your day! Thank you Michele…I love making pasta!